There’s a few times in your life when you get to see a true living legend in person. 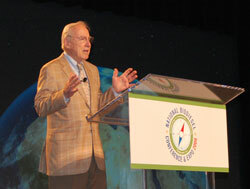 This morning was one of those occasions as I watched Astronaut Jim Lovell talk to a captivated audience of biodiesel industry folks at the morning general session of the 2008 National Biodiesel Conference and Expo. Talk about an inspirational speech! The man, who defied all odds and led his crew from a sure icy death in the vacuum of space when the Apollo 13 mission to the moon had a massive equipment failure, held the audience spellbound for more than 50 minutes as he told the story of how they overcame great adversity to make it back safely to the Earth. Lovell talked about how his team on the spacecraft moved quickly to preserve their dwindling resources so at least they would have a shot at making it home. But they were not alone. There was help back at Mission Control. Lovell told this morning’s gathering that he should not be there except for the teamwork, dedication and ingenuity of those involved. And he reminded the audience that they could choose to be one of three types of people: those who make things happen, those who watch things happen, and those who wonder what happened.